Katrina Kaif is a total badass. Over time, we have seen the actress perform some of her own stunts in movies like Tiger Zinda Hai. Her gruelling workout videos are inspiration to many. 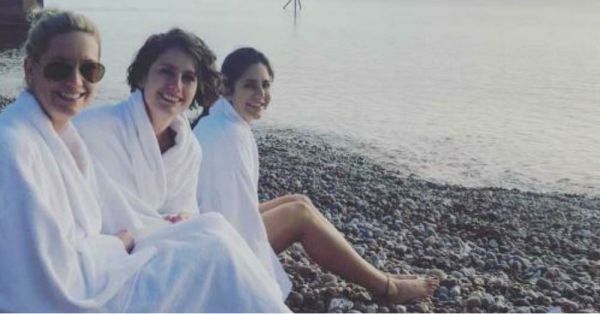 The actress showed us her adventurous side once again when she welcomed 2019 in her own unique way - by swimming in the zero-degree waters of the English Channel. The Thugs of Hindostan actress posted a video on her Instagram account of her taking a dig in the water with her girls. In the video, we see Katrina, one of her sisters and a friend running towards the English Channel and taking a dip in it. However, the freezing temperatures cut their expedition short and they can be seen scrambling out to the shore within a minute. Katrina had been updating her fans about her New Year plans on social media. Earlier in the week, Katrina had shared a picture of her in a red dress and party hat, all set to welcome the new year with a bang. She also shared a post-Christmas picture with a friend and captioned it, "Holiday cheer." Katrina has been really busy for the past few months now. Her holiday marks a well-deserved time off for the actress who had been busy promoting Thugs of Hindostan and her latest movie, Zero. Post her holidays, Katrina is expected to resume work on Ali Abbas Zafar's Bharat, which also stars Salman Khan and Tabu.